The Mammoth Book of Dieselpunk lives up to its name, with 21 works of fiction ranging from short stories to novellas. “Dieselpunk” is the term the coined for concepts that grew out of steampunk but have left the Victorian era behind and are now, for the most part, set in the time period between the two world wars. There are exceptions in this anthology; one story takes places during WWII and one during the American Occupation of Japan. What you get here, mostly, is writers having a lot of fun with pulp-era inventions and adventures. There are airships, of course. There are airplanes, rockets, tanks, Voltron/Pacific Rim-style robotic fighting suits; there are jetpacks and giant subterranean drills. Several stories deal with Prohibition, and several authors start from the fact that the “interwar period” was far from free of war, setting tales during the Spanish Civil War and reimagining the adventures of the American-funded Flying Tigers in China. I’m not going to review all 21 stories. I will list them with a brief one-or-two line description, and then discuss a few of them in depth. I’m also using different formatting. Usually I put short story names in quotations, but with this many stories it made for a very busy looking page, so I am bolding for ease and emphasis. Several of these stories are eligible to be nominated for Hugo Awards, and I’ve put asterisks by those. Sean Wallace, the editor, is eligible for a Best Editor, Short Form nomination also. Rolling Steel; A Pre-Apocalyptic Love Story, by Jay Lake and Shannon Page. In the midst of a heist in a very different 1930s United States, two damaged people meet and begin to fall in love. Lake and Page collaborated quite a bit while Lake was alive and it was nice to see them together again, too. Don Quixote,* by Carrie Vaughn. Near the end of the Spanish Civil War, two partisans have created a superweapon that may change the course of their struggle — and the nature of combat worldwide. An American journalist needs to decide what to do with what he knows about the weapon they’ve named Don Quixote. The Little Dog Ohori,* by Anatoly Belilovsky. An alternate view of the Russian front during World War II, seen through the eyes of a sniper in the Russian army, who is not the person she pretends to be. Vast Wings Across Felonious Skies,* by E. Catherine Tobler. A team of WAACs delivering an experimental airplane are caught up in a mysterious storm. When the pilot, Dorothy Sakura, manages to escape, she discovers that months have passed, the US is now at war — and she, as a Japanese American, is considered one of the enemy. Instead of a Loving Heart, by Jeremiah Tolbert. A mad scientist has trapped a man, an artist, into a robotic body. Can he find his way to freedom before he loses his humanity completely? Steel Dragons of a Luminous Sky,* by Brian Trent. In war-torn China, a Chinese agent and a Flying Tiger pilot encounter a strange young Chinese woman. As they plot to destroy Castle Tengu, the flying fortress of the Japanese, we see that no one is quite what they seem. Who can be trusted? Tunnel Vision,* by Rachel Nussbaum. Lloyd loves two things: prospecting in his antique drill named Jules, and seeing Alma, the proprietor of Around the World Curios. Lloyd’s underground adventuring brings him, and the drill, to the attention of an ambitious bootlegger, and things get dangerous quickly. Thief of Hearts,* by Trent Hergenrader. Hieronymous Dismas is the greatest thief in post-Spanish-Civil-War Granada. When he is forced into a job for a nasty aristocrat, he loses his heart. This story was like a prose version of a painting by Goya, or maybe Dali. In Lieu of a Thank You,* by Gwynne Garfinkle. Once again a mad scientist is center stage, as Dr. Ernest Clive abducts socialite Vanessa Grand. He intends her to be the subject of one of his many experiments, as he grafts animals parts onto humans, but things do not work out as either of them intend. This Evening’s Performance,* by Genevieve Valentine. During the Great War, Britain used automatons as soldiers. Now that the war is won, automatons are finding their way into every walk of life, even live theater. Valentine’s novella follows a troupe of human actors as each performer comes to grips with this development. Into the Sky,* by Joseph Ng. The Terra Cotta Soldiers in this story are mechanical, driven by human operators. In this story, a loyal soldier must choose between glory and love. The Double Blind,* by A.C. Wise. A story of Prohibition, speakeasies, corruptions and politics. Heiress Ronnie prowls the night in cat-burglar clothes, seeking revenge for an attack on her sister. When her friends at the speakeasy called the Double Blind are put at risk, Ronnie must consider what truly matters. Black Sunday, by Kim Laken-Smith. This dark fantasy takes place in a blighted town in Oklahoma, at the beginning of the dust bowl. Although there are several kinds of magic involved, the story has a subterranean drill and a couple of intrepid explorers. We Never Sleep,* by Nick Mamatas. What is Industrivism, anyway? The pulp writer and her conflicted Pinkerton friend Jake really want to know. It has to do with union busting, pogroms in Europe, the American Dream and Rudolph Diesel, who may not be as dead as reports have let us believe. Cosmobotica,* by Costi Gurgu and Tony Pi. When saboteurs hijack Henri’s rocket, headed to the moon, it is up to Henri and his Romanian team to get it back on course. They must do this from earthside, and also from within the rocket, where Henri injects his conscious into the rocket’s robots. Henri must address self-doubt from an old failure, and his own mortality, as he struggles to regain control of his rocket. Act of Extermination, by Cirilo S. Lemos, translated by Christopher Kastensmidt. The story is a blend of jet-packs, robot armor, spies, assassinations, and cloning, swirled into a moody James-Bond-like adventure with a decidedly Latin American flavor. Blood and Gold,* by Erin M. Hartshorn. Sentient, intelligent dragons in New York City during the gangster era. I will say nothing more. I mean, do I need to? Floodgate,* by Dan Rabarts. In this fantasy adventure, a downed flyer with vital camera footage of a terrifying new weapon being developed in Tunis is taken up by a rogue company of Maori soldiers. They head to Tunis. Is their goal to destroy the weapon, or something else entirely? Dragonfire is Brighter than the Ten Thousand Stars,* by Mark Robert Philps. Imagine that the Roman Empire continued on for two thousand years, at war with a Chinese dynasty, and that both sides had living dragons as weapons. Now imagine that warfare has become more modern and might even be considered a cold war. Then consider this story a spy story. Mountains of Green, by Catherine Schaff-Stump. In occupied Japan, two orphaned children struggle to survive. Kayo struggles to evade the unwanted attentions of an American soldier and still provide for her younger brother. When the brother is hired as a guide by an American doctor who is looking for “mutations,” an explosive act is set in motion. The Wings the Lungs, the Engine the Heart,* by Laurie Tom. Experimental technology can keep a person alive even with a defunct heart, through a machine functioning outside the body. A worried doctor tries to keep Germany’s ace fighter pilot alive, even though he will never get into a cockpit again. The best story in the book is Mark Robert Philps’s Dragonfire is Brighter Than the Ten Thousand Stars. It has the most imaginative alternate world, and the story itself unfurls like a John le Carre spy novel, which is a high compliment from me. The Roman Empire existed for two thousand years longer than it did in our world, aided by the fearsome, fire-breathing flying dragons the patricians domesticated. The Empire’s enemy was the Chinese People’s Mandate, which also had dragons. The Mandate explored mechanical weapons of war, and defeated the Empire in battle at the turn of the twentieth century. Almost immediately, a revolution began within the Empire’s borders. The former empire is now a totalitarian regime called the Commonwealth. Gaius and Attia were students and part of a revolt against the government that failed. Gaius, who now goes by Artur, has always believed Attia betrayed him. Attia, a gifted metallurgist, went to work for the Commonwealth. When Gaius is captured by Commonwealth intelligence agents, the story takes a strange turn, and soon Gaius is on a perilous undercover mission deep in the People’s Mandate. He does not know who he can trust, and somewhere ahead of him is the enigmatic woman who betrayed him, but who he still loves. The dragons are all dead, of natural causes or from the war, but their presence is everywhere; skeletal remains and artistic interpretations show up throughout the story, alongside details that made this world seem real and dangerous. The ending is sad and luminous. Philps get every note and every detail right here, immersing us in a Cold-War era spy story from a world that never was. After Dragonfire, my favorite story was Cosmobotica, by Costi Gurgu and Tony Pi. This took me by surprise since this was the kind of story I’d have expected to find in Isaac Asimov’s Science Fiction Magazine or Analog, circa 1970. That’s usually not my kind of thing. The combination of an interesting story, lovely writing and a character I cared about all combined to make this a delightful read. Cosmobots are space-faring robots and their creator, Henri Coanda, is about to land a rocket staffed with 2 of them on the moon. Henri is in the rocket with them, but not physically — his body is back at the home base in Romania. Because of scientific breakthroughs, he and he partner can “presence” into the robots. When saboteurs hijack his partner’s ‘bot and hijack the rocket, Henri and his team must act to stop them. He has to face his own self-doubts after a public failure years earlier, and his own mortality, to regain his rocket and save the mission. Henri is a believable character who is competent and smart, and his earth-side team doesn’t just listen to his brilliance and nod appreciatively, they actually help. This suspenseful, action-packed story pinned me to my chair and wouldn’t let me up until I reached the end. This Evening’s Performance is a novelette by Genevieve Valentine. Britain was on the verge of losing World War I when they created automaton soldiers. Now the war is over, Britain victorious, and the automatons are still here, finding their way into civilian jobs, in this case, live theater, where they are called Dramatons. For Emily, her husband Peter and their friend Roger, the three remaining members of the famous theater troupe The Understudies, this is a serious development. While Emily and Roger are fiercely talented actors, Peter isn’t, but what he lacks in talent he makes up for in charisma. The story is about how each of them faces the threat to their careers. There is a type of speculative fiction story that looks at societies and people in transition. In doesn’t go all gaga over the hardware or the software, instead, it wonders how the hardware/software will change things for people… all kinds of people, even actors. This is one of those stories. This is also a story that loves theater. If you like Valentine’s prose, if you love sociological speculative fiction, and if you enjoy live theater, you will probably love This Evening’s Performance. Although I thought the pace was too leisurely for the amount of story here, I loved it too. Tunnel Vision, by Rachel Nussbaum, has an underground drill, a laconic prospector, a smart girlfriend, a ruthless, ambitious bootlegger and a network of underground tunnels. The voice of Lloyd, the prospector, is pitch perfect and the story is filled with atmosphere. Lloyd’s attachment to Jules, his drill, is completely believable and makes his choices harder and more plausible. Jackie the bootlegger is an awesome villain. I’m interested in Prohibition right now, and this is a perfect alternate-Prohibition story. Steel Dragons of a Luminous Sky by Brian Trent transported me back to the 1940s and ‘50s and books like Doc Savage, Man of Bronze. Li Yan is an agent of China’s super-secret Luminous Sky, an organization dedicated to protecting the nation, which is currently torn by civil war and facing an external threat as Japan, with its giant robots, attacks its borders. Li has plenty of fancy gadgets himself, and when he and his American pilot buddy, Eva (a Flying Tiger), discover a secretive Chinese girl named Xin in the aftermath of a battle, the three of them decide to take on Japan’s flying fortress, Castle Tengu, and destroy the transmitter that controls the robots. Eva is a tough, wise-cracking sidekick and mysterious Xin is no slouch herself. The story is all action, vivid, colorful descriptions, reversals, lies, fun gizmos… and did I mention action? It’s a gallop of a story. We Never Sleep by Nick Mamatas also conjured up the days of the pulps, and his main character is a pulp writer. The pulp writer has gotten an assignment to write about Industrivism. She needs to write brochures and articles about it, but nobody knows what it is, not even her friend Jake, who works as a guard at a factory, and is the go-between for the enigmatic Old Man and the pulp writer. Jake is haunted by evil dreams, dreams he thinks come from a guilty conscience (he helped in union-busting at a factory as a Pinkerton), but they are truer than he realizes. Mamatas has an ear for ad copy and for dialogue; he understands propaganda; and he puts those skills to excellent use here. It’s an intriguing, fascinating story. Rolling Steel: a Pre-Apocalyptic Love Story was written by Jay Lake and Shannon Page, who collaborated on other works as well. They were excellent collaborators and in this story, while the point of view shifts between two characters, there are no seams or moments of dislocation. I confess I didn’t really understand what was going on for a while, until I did something earthshaking and looked at the title again. Then it became clear. This really is a post– pre-apocalyptic love story, as Grace and Topper, two strong but badly damaged people, try to figure out where their lives are going. Oh, and steal a bunch of stuff along the way. Grace’s crisp, snarky, down-to-earth voice contrasts with the strange point of view of “our Topper,” a man who has done very bad things and cannot, it seems, completely forgive himself for them. I’m making it sound like it’s some dreary character study… um, no, because they are dodging bullets and bombs, and firing back from Topper’s customized tank Rough Beast pretty much all the way through. Anatoly Belilovsky’s The Little Dog Ohori and Carrie Vaughn’s Don Quixote both take a different look at historical events without much change; Belilovsky’s on the Russian Front and Vaughn visiting the Spanish Civil War. Floodgate by Dan Rabarts gave us a new take on monsters, and a main character from Australia, who had a lot of issues to work through. I liked the main character and the way the story forces her to come to grips with her beliefs and her guilt. Again, this doesn’t mean it’s short on action or suspense. The Wings the Lungs, the Engine the Heart, by Laurie Tom, was a bittersweet story about injury, loss and the lengths a person will go to do the thing they love, set in World War I, with a famous German flying ace and the doctor who tries to save his life. I had a lump in my throat by the end, because I believed in the common ground the working class doctor had found with the celebrity aristocrat. That’s barely half the stories in the anthology. 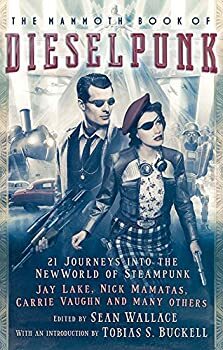 Because of the name “Dieselpunk,” you would not expect a lot of fantasy stories here, and in fact I think only Black Sunday qualifies, but at least two other stories have “science” that looks a lot like magic (or at least surrealism). Any reader who likes pulpy action, interesting takes on alternate history, big machines, rum runners, airplanes, tanks and gadgets will find several stories here to enjoy. I never really pick up story collections but this sounds great! I’m trying to read more short fiction and this was a good choice for me. It’s a good selection, with different types of tales. This sounds really good, Marion. I think I’m going to have to pick up a copy for myself.